A gay rights activist dances during gay pride march in Belgrade, Serbia, Sunday, Sept. 20, 2015. 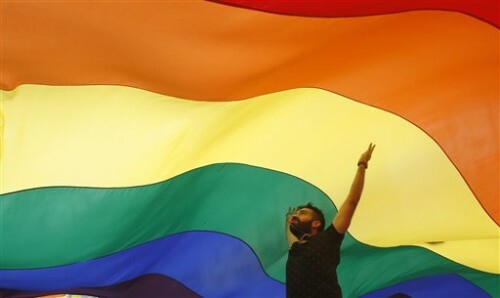 Hundreds of gay and human rights activists at Serbia’s gay pride event have called for solidarity with migrants passing through the Balkan country in search of a new life in Western Europe. BELGRADE, Serbia (AP) — Hundreds attending a tightly-secured gay pride event on Sunday in Serbia called for solidarity with tens of thousands of migrants passing through the Balkan country in search of a new life in Western Europe. The colorful pride march was held in the capital, Belgrade, thanks to thousands of riot police in full gear deployed in the downtown area to protect the gathering from right-wing extremists and soccer hooligans. Police have detained several extremists for planning to attack the event. In 2010 extremist groups and soccer hooligans attacked another gay pride gathering in the conservative Balkan country, triggering clashes that left more than 100 people injured. Anti-gay sentiments are high in the traditionally macho culture, but government has pledged to boost human rights as the country seeks membership in the European Union. Opponents include the Serbian Orthodox Church, whose priests have taken part in anti-gay marches. Activists at Sunday’s pride in Belgrade said migrants, like gays, were seeking their basic human rights to be able to live and work freely. A black-and-pink banner read “Europe, Open Your Gate” to the men, woman and children fleeing war and poverty. Thousands of migrants from Syria, Afghanistan and other troubled countries of the Middle East, Africa or Asia have passed through the Serbian capital in the past months, many camping in parks in the open.